A short preamble: one of these days I’ve got a problem – it was necessary to send several web pages (a series of publications from one of my favorite sites) to my Kindle reader. As you might know that’s not a big deal and can easily be done as described in this post. But this time I wanted to have a table of contents in the result book, to navigate between those publications. And I’ve found the solution described below. So, how have I done that? First of all, I’ve turned off immediate delivery on my Settings page. Then I’ve sent all web pages I wanted to have in the Kindle book, using default bookmarklet. Please note, they were not sent actually, instead, they were processd by the system and saved to my Sendtoreader account. Once all those pages have appeared in the “Recently sent pages” list, I’ve added a new tag to each of them (the highlighted one on the screenshot). You can skip this step if all web pages you are going to join in the book are all from the same website… the only thing which is required here – at least single tag which is the same across all the pages, we’ll use it later. The final, short part. Now you have everything in place, and all you need to do – setup new “Digest” periodical. So, open My Periodicals page in your browser and create a new digest as shown on the screenshot. The important thing: you should select the tag assigned to each of the docs mentioed above in the “What to send” dropdown menu. /in this case the result book will contain only pages having that tag. Now set up the time of delivery, set current time (hours) to receive the book in 5-15 minutes. And… that’s it, there are no more steps, just wait for the book a little. Once it’s received, you can delete the periodical, it was temporary, and revert the delivery settings – make it instant again (if it was instant). Questions? Comments? Feel free to ask! 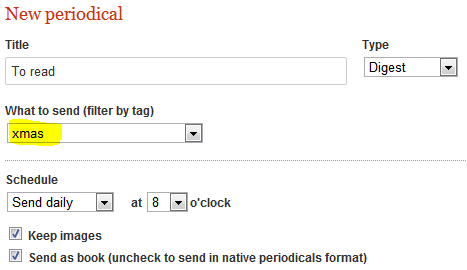 setup daily digest periodical to the next hour with the tag filter (use tag from the previous step). Wait a little; Voila, your doc is on kindle. This works well apart from one thing. A comedian friend of mine writes blogs and I thought I would collate them into a Kindle book for each year. However S2R reverses the order. I’m trying to download an online manual of Sigil(http://web.sigil.googlecode.com/git/contents.html) with S2R, but I could only see the first page on my kindle. Is there a way to download the whole manual(ie. with all the level down below)without entering all the related urls? At the moment there is the only way to do that – using Import option in Composer for each of those links. Hello! I’ve saved a number of web-pages in HTML format plus a pictures and elements folder on my hard drive. Is there a possibility to load them to your web-site and create a book? Thank you. You can of course copy-paste your materials into a new book using Composer, but its functionality is quite limited. I’d suggest you to search for an offline ebook editor, I’m sure you’ll find one easily on Kindle book authors forums. I think the free program calibre has ability to convert html documents residing in one folder on your hdd into a book with Index of chapters and hyperlinks. i have not actually tried calibre in this way, but it can create a .mob format book based on the html documents, for your kindle, to read on it. but how to create the html documents folder on your hdd first ? there are any number of off line web-browsers that can do that, downloads entire sites with pictures. you have to set the restrictions under options to download one link deep only, to avoid unrelated downloads in complex sites. anyone can try it and let me know how it works out.